The caressing of the cover and holding it to his chest show so much. Books matter. I’m sure J won’t forget this moment. It was his gestures that made me want to capture this as a slice. Wow! Gave a guitar! That’s amazing! I am often astonished at how much an unexpected gift can mean & love being part of the giving. Okay, this one almost made me cry. It is a constant joy to see a book in the hands of a young person and to read about the moment of adoption, a connection made, is singularly precious. Thank you, Amanda. Also, you have illustrated yet another reason librarians (and teachers) are so important to a society that values freedom of thought. Our school librarian is an absolute wonder. I cannot even begin to share all the things she does to support our students (and teachers). Pretty sure she’ll have a copy of this book available soon. I wonder if any of your students will take you up on it. It’s a really good book. I’d love to hear what they think. What a lovely, lovely story! How good it is when a certain student ‘connects’ in such a special way with a book and how good that your friend could give him a copy to keep! My friend really was incredibly generous – and connecting a book to its perfect reader really is magic. Caressing the cover and pulling the book close. Wow! You’re doing incredible work with your readers, Amanda. A random act of kindness always brings such joy. I am glad that J found something important that has become his own. Small moments like the one you mentioned make for such fond memories that teachers cherish. Perhaps, this child will become a lifelong reader because of what you offered, Amanda. Thanks, Carol. After his sharing yesterday, I’m hoping to help support him as he becomes the first in his family to graduate from high school! 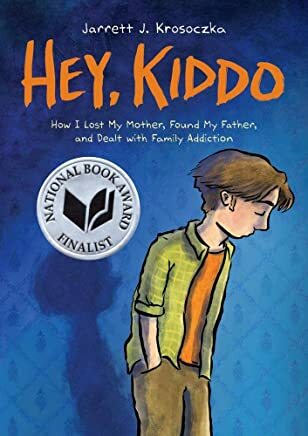 I haven’t read “Hey, Kiddo” yet. Maybe I should get it for a special student. May good things return to your generous friend and to you. I love happy book stories! Thank you for sharing this one especially. There are so many ways to establish relationships with students and your example offers a few: offering your students a variety of texts to choose from, truly allowing and validating their choices, letting them share in their own time what their reading is offering them, making sure that this student would have continued access to a book he was enjoying, providing the warmth and safety in the small group for him to share his story. All those details and more add up and deliver an impact the extends far beyond the length of a school year. I am grateful not only for this student but for all the other ones who enjoy the benefit of your kind attention to their whole selves and their flourishing through reading and care. Go Amanda! What an inspiring slice! Allowing and validating choices is so important! ” A book made someone fell less alone in the world.” You did, too. Magic! What a gift you both have given him. I’m not a graphic novel reader. I have to remind myself to buy them for the class library. The kids love them! Kids really do love them. I’ve been trying to get into graphic novels this year & I have to say that I’m better at understanding the appeal. I still prefer a book with all the words, but graphic novels are starting to make more sense to me… after reading a couple dozen… sigh. Ooo… that moment. Makes me think of the books that disappear from our class library that I fret about briefly and then wish well in their new homes. To give gifts *intentionally* from the library when I notice a special connection made, now that’s got me musing. I have a boy in my class who just doesn’t seem to “connect” with any book at all. He fusses over the whole process of finding one, then sits down and looks at it, and then tosses it aside…you know the drill. I really want him to connect with a genre, a series, anything at all. I’ve just realized that I haven’t given graphic novels the attention they deserve, but I also think he hasn’t discovered them. Your post makes me want to give them a chance in hopes of reaching this reluctant reader of mine. Thanks for always inspiring me! Ooh- what grade is this? My son – the one with dyslexia – is in 3rd and has devoured graphic novels this year – as has his brother in 5th- so I have recommendations. Oh, this one gave me goosies! That “really? for me?” got me. I often can’t help but give away those magical just right books to the students who love them most.